Not having enough hours in the day seems to be a common dilemma. Our days are often carved out with a long list of tasks and errands, and it’s challenging to make time for preparing nutritious meals. 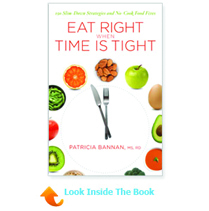 Patricia Bannan MS, RD and her new book Eat Right When Time Is Tight:150 Slim-Down Strategies and No-Cook Food Fixes can help! In it, Patricia offers practical suggestions on how to maximize nutrition with minimal time. Addressing many of the common concerns of people on-the-go, this book will help you restructure your day so that there’s always time for healthful meals. Most of us are familiar with the adage “breakfast is the most important meal of the day.” So how important is breakfast and how can we fit it in if we barely have time to brush our hair before running out the door? You probably already know you should eat breakfast, but if you’re too busy in the morning or you’re not hungry first thing it’s probably not going to happen. 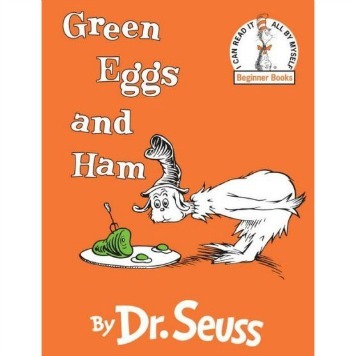 That’s why a master strategy in my book is not to eat breakfast, per se, but to “Munch Every Morn” — eat something with protein and fiber within two hours of waking up. It can be as simple as some nonfat Greek yogurt with nuts, an egg with a slice of whole-wheat toast, or a packet of oatmeal with some all-natural nut butter mixed in. This simple strategy can boost mood, help mental performance, improve your immune system, and encourage weight management and better eating choices the rest of the day. Here are some more delicious breakfast ideas! Snacking is often part of our day, whether we’re on the go or not. How can we make sure we’re snacking right? What are your 3 favorite go-to snacks? When it comes to snacking, the question isn’t whether you’ve snacked today, but what snacks you ate. New research shows we’ve become a nation of snackers. A whopping 97 percent of Americans snack daily (up from 71 percent thirty years ago). If you’re anything like the average person, snacks now contribute one-quarter of calories to your daily intake. Fruit & cheese. Have 1 piece of portion-controlled cheese (e.g., Mini Babybel Light) with 1 fresh pear or 1 cup of grapes. Bar it. 1 whole-food bar (made with whole-food ingredients like nuts, dried fruit and whole soy) and 1 can of low-sodium 100 percent vegetable juice. Hummus lovin’. Spread 2 tablespoons of hummus on a ½ warmed whole-wheat pita, or serve the hummus with a ½ pint of cherry tomatoes. When time is tight, what is one of your quick, easy, and healthy meals for lunch or dinner? This dinner is from my “Starving at Six Meal Plan” – for those days when you’ve been on-the-go nonstop and haven’t eaten enough… you get home and you’re famished! This is super healthy and can be thrown together in no time at all. – Heat brown rice and vegetables separately in the microwave. Mix with heated shrimp (or other lean meat) and chopped nuts. Top with low-sodium soy sauce. Eating out is another side effect of not having enough time. What are your top 3 strategies for eating right when dining out? AppeSize your meals. An AppeSizer is an appetite speed bump. And just as a cement speed bump slows your car, an edible speed bump slows your eating. An AppeSizer is something that’s low in calories and takes time to eat. 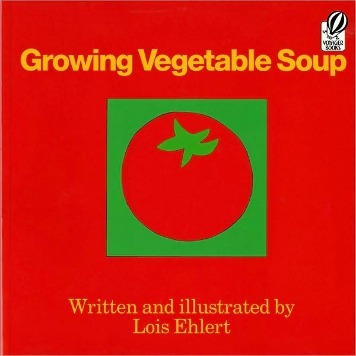 A bowl of broth-based soup, an apple, a handful of sliced veggies and spicy salsa—all make excellent AppeSizers. This is a great strategy when eating out. You can have an apple before you head to the restaurant or order a cup of broth-based soup when there to re-size your appetite. Ease up on alcohol. On average, an alcoholic drink contains about 150 calories, but order a large frozen daiquiri and you’re drinking 500 to 800 calories. Yikes! 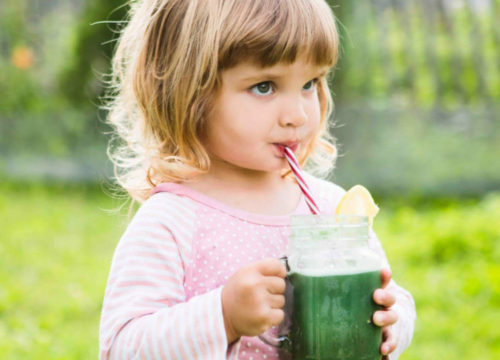 Make your first drink non-alcoholic like sparkling water, diet soda, or even tomato juice. In other words, pace yourself. Set a limit beforehand—say, two or three drinks—and stick to it. Get steamed. You may think you’re doing great by ordering veggies at a restaurant, but often times your super-healthy spinach is slathered with butter or drowned in oil. Even if steamed veggies aren’t offered on the menu, most any restaurant will cater to such a simple request. In the book, you mention sleep plays a role in health. How does sleep affect eating in particular? It’s so important to get enough pillow time. Not only are tired people more irritable, distracted, and spacey—they are hungrier as well. One study found that men who only slept for four hours consumed, on average, 559 calories more the next day than men who slept a full eight hours. Another study with women found those who slept the least (less than five or six hours per night) were significantly more likely to gain weight over time than women who slept seven hours or more. A lack of sleep is also correlated with childhood obesity. Researchers aren’t exactly sure of the connection between sleep patterns and weight, but getting insufficient REM, or rapid eye movement, sleep (the time when you dream) may affect your body’s natural circadian rhythms that control metabolism, resulting in feeling hungrier than usual the next day. Aside from eating well, exercise is also key for good health and slimming down. Busy moms are often over-tired and have limited time to get to the gym, how can they still fit in exercise during the day? Aim for ten minutes. Research shows that three ten-minute stints of activity provide the same health benefits as one continuous thirty-minute session. Wear a pedometer. See how many steps you’re walking a day and gradually increase it by 500 each week until you reach 10,000 steps a day. Get an exercise buddy and hold each other accountable. What is your 10 second take-away advice for those who are always in a time-crunch? My book is packed with side bars on various topics, and for those who don’t have time to read the whole page or need one or two simple things to focus on each side bar has a 10 second take-aways. For example, here is the 10 second take-away for the “Shaking Off the Salt” side bar. Limit your salt intake to 2,400 mg a day or less by reading the Nutrition Facts label. Choose kosher or sea salt, as both contain natural minerals and slightly less sodium than table salt. Choose fresh foods over processed to reduce your salt intake. Patricia Bannan, M.S., R.D., is a Los Angeles-based registered dietitian specializing in nutrition and health communications. She develops news segments for television stations, writes articles for magazines, and serves as a consultant and spokesperson to PR agencies and industry groups nationwide. Patricia has appeared as a guest expert on news shows, including ABC, CBS, Fox, and NBC’s Today show. She has written articles for such leading magazines as Self and Shape and has been interviewed by numerous print media, including The New York Times, Newsday, People, Redbook, and Ladies Home Journal. She is the author of Eat Right When Time Is Tight: 150 Slim-Down Strategies and No-Cook Food Fixes (NorLightsPress, 2010).